Inheriting a property is generally something that’s tacked on to the end of bad news. Once the air has cleared, you’re left to sort out the situation with the property. What do you actually want to do with the property? Get organized first, have the important discussions that you need to have, and after the groundwork is done, you can get down to brass tacks and set your final plan in motion. It can sometimes be hard to make the right decision, especially if you’re going through a difficult time with your circumstances. You have a lot of pros and cons to weigh, and in an ideal outcome, you’ll select the path that involves the most pros for you and your loved ones. If you’re an only child, all you’ll need is a simple internal dialogue and some time to think things through. If you have siblings affected by the inheritance of this property, you’ll need to have a meeting of minds to keep everything fair and consider everyone’s feelings. If the property was left specifically to you instead of your other sibling(s), you need to touch base with them to see how they feel about the ordeal if you want to avoid any conflict. They need to help you handle the estate, and ideally, you want their support in the final decision of what’s going to happen with the house. You can’t do anything with the property until you’ve sorted through everything inside of it. There may be things that other family members want that weren’t specifically discussed in the document, and you need a functional system for doling those things out. As a general rule, the adult children should have the first pick, and then you should let things trickle down to the younger ones. Whatever is garbage or unwanted should be thrown away or donated, and areas like the attic and the basement need to be cleared out. Once everything is out of the house, give it a deep clean. This is the big question, and the answer may not come to you very easily. If someone wants to live in the house, that makes things easier. If you or a family member wants to move in, that process is fairly simple. If you come to the conclusion that it’s best to sell the house, you’ll need to find a buyer and get it market ready. If you want to rent the property out, you need to become a landlord or find someone else to manage the property. If you want to sell it, you have to consider the work that will go into preparing the house for the market. You also have to make sure you won’t face any obstacles in your family members who may have hostile feelings regarding that decision. If the house needs a lot of repairs or improvements, you may want to fix it first. If you have no interest or funds in doing so, you may be able to find an investor to take it off your hands and repair it themselves. If the house is already in good condition or you’re willing to get it there, you may consider going through a realtor. 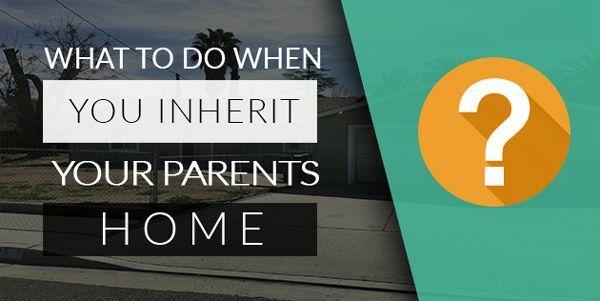 This method can potentially take a long time, depending on the value of your inherited property, where it’s located, and the local economy. If you want to rent the property out, that becomes a business venture. It may seem appealing to receive a rental income, but you need to be willing to put in the work. This option forces you to make necessary improvements, and while you’re at it, you might as well do the makeover work in order to make the property appealing to potential tenants. If you don’t want to deal with all of the business aspects, you may want to hire a property manager. You’ll ultimately be responsible for keeping track of the property manager, and you’ll also be paying their salary out of your rental income. You’ll make less profit going this route, but something is better than nothing. It may be worthwhile to use a property manager if you have a full time job and cannot tend to all the responsibilities of running a rental on your own. Decide who’s going to live in the house, whether it’s you or another family member. Have things transferred into the owner’s name, and flip the utilities over. With several different courses of action, each of which requiring their own steps to completion, you need to form a road map for how you anticipate the process to go. Staying organized and keeping a watchful eye on the money surrounding the property, the people involved in handling it, and any budget you may have set aside to modify it will prevent you from getting in over your head to quickly. Whichever plan you choose, you’ll need to set your course of action. This may involve making checklists, investigating potential buyers, or hiring help, such as repair specialists or a property manager. You’ll also want to consider backup plans and safety nets. What if things go bad with the tenants you rent to? What if your house sits on the market for too long and goes through a series of price reductions? It never hurts to have a Plan B, just in case you need to use it. No matter what you do, you’re going to have to deal with taxes on the property, so don’t forget to keep all of your important paperwork and receipts secured in a safe location for when it comes time to use them.